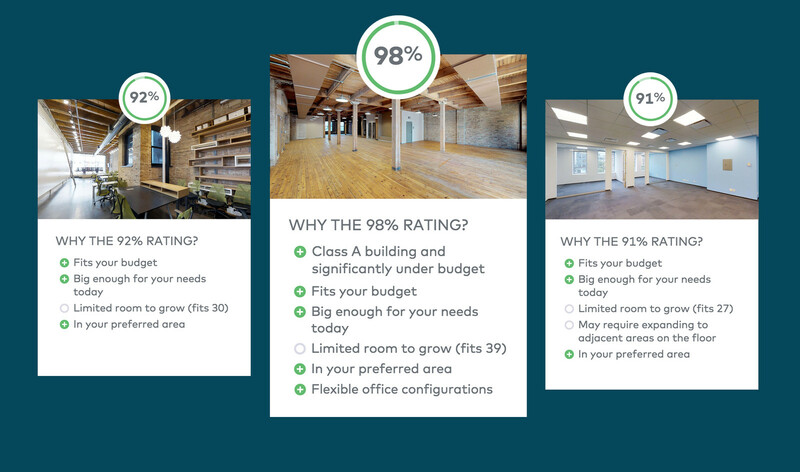 Like we've said before, we know that small business owners have a lot on their plates, and taking the time to find new office space for their company is not on the top list of priorities in most cases. Because of that, we've made sure that our platform is easy-to-use, interactive and convenient. Thanks to 3D virtual tours and artificial intelligence (AI), we make the search doable and less time-consuming. Virtual tours cut the time it takes to sign a new space nearly in half. Plus, you'll get a new friend in the process, Vera, a super smart, AI-enabled chatbot who helps you through the process. After your search, you are able to see properties that fit your criteria by features including location, price, square footage, etc. With our proprietary data, our platform makes sure the customer can find the best results fitted for their business. Save time and stress and start your office search with us.